Bling bling, glitter and glam is what is seen in the fashion world today. But, as one Indian designer sees it, it's all about going back to simplicity. 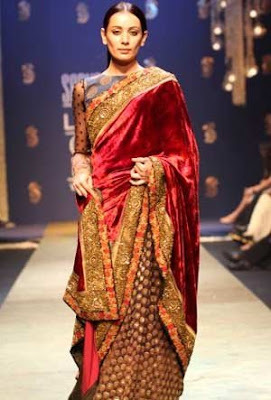 Sabyasachi Mukherjee is a young Bengali designer who has opted to go back to the traditional India through Khadi. Khadi is a homespun and handwoven cloth that was mastered by Gandhi (recall the spinning wheel or 'charkha'). Khadi symbolizes the freedom struggle and independence of India; many Indian politicians wear clothing made of this fabric now! Not only is the fabric beautiful, but it is elegant, sophisticated, eco-friendly, and comfortable as well! 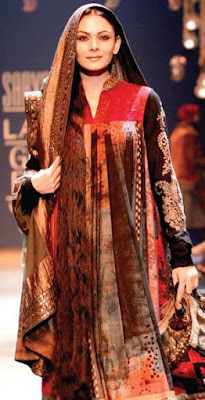 Khadi is often made and worn by the rural poor class of India, and this has not gone unnoticed by designer Mukherjee. He is now working with the rural class of India in order for them to share in the growing Indian economy. By setting up four different cooperatives with rural craftswomen across India, Mukherjee works with the poor class in order to produce clothing. Half of the payment that the workers receive goes home with them, and the other half goes towards rural community development. Below are a few of Mukherjee's beautiful designs.